The way that DNA encodes the instructions for proteins is through a set of four molecules called bases, each of which represents a letter of the genetic code (A = adenine, C = cytosine, G = guanine, and T = thymine). The bases are made of carbon and nitrogen rings and are bound to a sugar and a phosphate to form a nucleotide. The nucleotides are connected together to form a long chain with the bases pointing out. 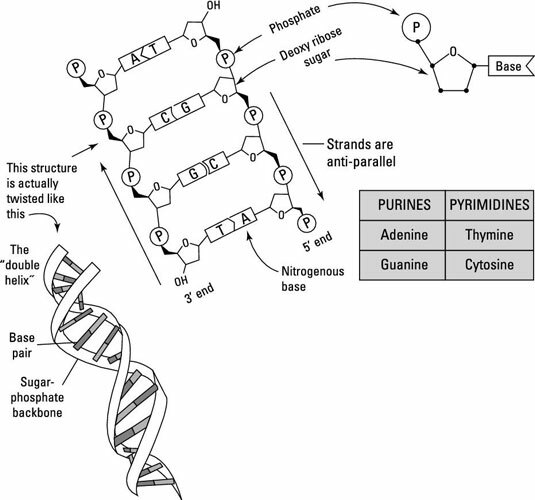 Because the nitrogenous bases can interact with each other — A binding with T and C binding with G — two such chains placed opposite to each other form the ladderlike structure of DNA, with paired bases making the rungs of the ladder. Nucleotide bases will always pair in the same way, so each strand of DNA has the same sequence when read in the opposite direction to one another. The fact that each of the two DNA strands has the same sequence is called complementarity; it’s essential to making sure that all cells get the same instructions during DNA replication and cell division. Covalent bonds attach the subunits of the backbone together, whereas hydrogen bonds hold the paired bases together. Because these hydrogen bonds are much weaker than the rest of the bonds, the bases can be pulled apart, allowing things like DNA replication or RNA synthesis to occur. The genomes of bacteria and archaea are, for the most part, arranged as a single circular chromosome and some extra-chromosomal genetic material, called plasmids. The chromosome contains all the essential genes required for life, whereas plasmids contain useful but not strictly essential genes. Eukaryotic genomes are usually contained in multiple linear chromosomes, although they can also have plasmids. A bacterial genome is twisted up on itself to compactly fit inside a bacterial cell. The DNA for the genome of a eukaryote is wound around proteins called histones that help compact it without the DNA strand getting tangled. Archaea have a single circular chromosomelike bacteria that is wound with histones like eukaryotes. The genomes of viruses are much shorter and made up of RNA, double-stranded DNA, or single-stranded DNA.